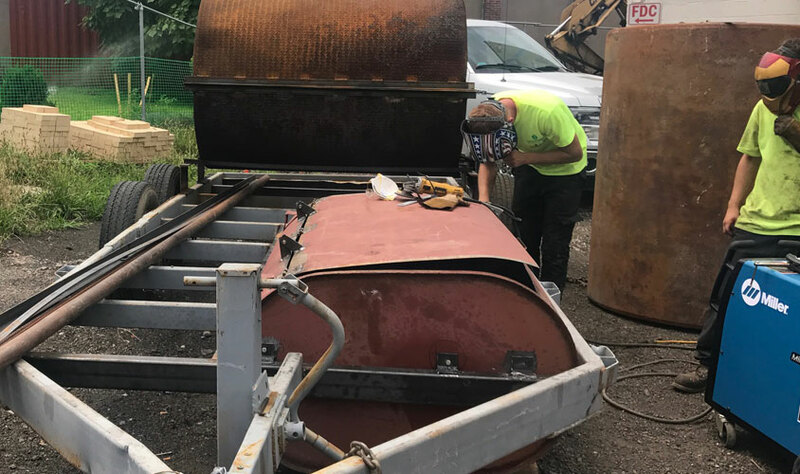 Spinning straw into gold, we’ve taken some old oil tanks we’ve removed and are crafting a custom-designed mother of all mobile-BBQ units. This one-of-kind trailer will be available to any of our customers for use free of charge. We encourage the use for charity functions and fundraisers which will take priority over personal functions. We estimate availability starting by August 15th. Watch our TankQue being built (check back for updated photos). Wood burning pizza oven, can easily make 50 pizzas per hour! Wood fired rotisserie with 3 spits that can handle 3 pigs at once. the fire will be on the side allowing collection vessels to collect every last drop of goodness. Smoker with shelf after shelf, we estimate it will be able to hold and smoke 100 racks of ribs. 3 barbecues with over 50 sqft of cooking space. Two indirect chambers where over 100 chickens can be suspended and slow cooked. A “Bern, Baby, Bern” (#51) chamber — where wood can be burned and the coals can be collected to use in any of the other units. For more information and availability, please call us (973) 458-1188 or connect by email using the form on this page.